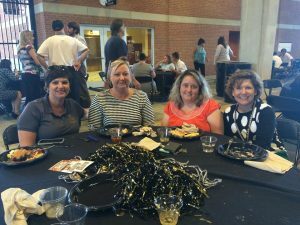 The 2017 Staff Appreciation Picnic will be held June 6 at BB&T Field. Called “Tailgate at McCreary Tower,” the event will be held from 11 a.m. to 1:30 p.m. The Staff Advisory Council and the Office of Wellbeing invite all staff members to attend. On the menu will be: burgers, hot dogs, wings, pulled pork, veggie burgers, salads, desserts and more. A number of games, including lawn games, are planned. In the spirit of Pro Humanitate, the Staff Advisory Council is also sponsoring a book drive on behalf of Mineral Springs Elementary School. New or gently used children’s books are requested. –In front of University Corporate Center. Parking will be available in the Gold Lot at BB&T Field.